I've been adding photos taken by the Barnsley War Memorials Project Information Officer, Pete, in Barnsley Cemetery, to an index page for War Memorial Gravestones there. I was intrigued that Crossland Barraclough's next of kin on his Commonwealth War Graves Commission (CWGC) entry was his mother, Amelia who lived in Wallsend-on-Tyne (that's how they wrote it!) That and his unusual name ... presumably a family name for a first name, but we will see. My own grandmother was born in Wallsend in 1907. There will be no connection between the two I'm sure, but simply the coincidence of the place attracted my attention. Easy to distract from 'proper work', that's me, especially in the current heat! It's 24 degrees in our dining room where I'm sitting typing this. 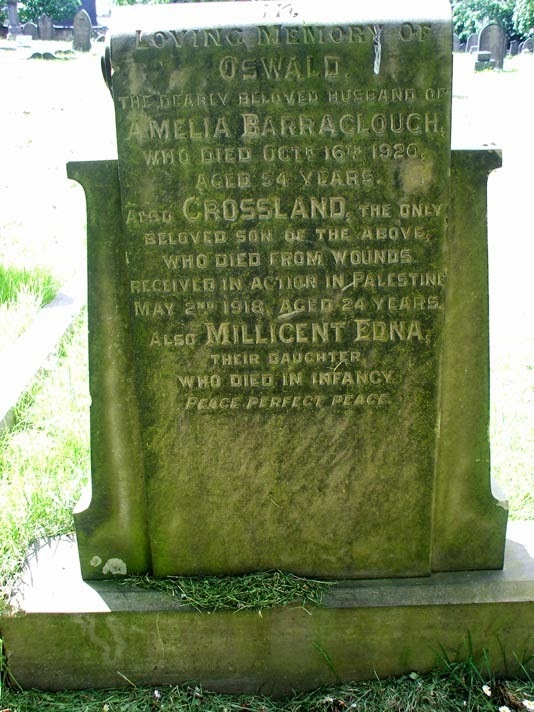 In Loving Memory Of / Oswald / the dearly beloved husband of / Amelia Barraclough / who died Oct. 16th 1920 / aged 54 years / also Crossland, the only / beloved son of the above / who died from wounds / received in action in Palestine / May 2nd 1918, aged 24 years / also Millicent Edna / their daughter / who died in infancy / Peace Perfect Peace. We can see that his father, Oswald, died in 1920. So that means that the CWGC entry shown above was compiled after his death as in that he is referred to as 'the late'. There is also a sister who 'died in infancy'. Lots of clues. But why did Amelia end up in Wallsend? Checking on Ancestry for Crossland's Soldier's Died in the Great War record I see that it appears he lived in Wallsend when he enlisted, but that he actually enlisted in London into the London Scottish Regiment. This agrees with the CWGC entry. Crossland's Army Service records do not appear to have survived and the Long, Long Trail website, which is usually very helpful about the movements of various regiments can only tell me that the 2/13th and 2/14th (County of London) Battalions arrived in Salonika in November 1916 and then moved to Egypt arriving in Alexandria on 5 July 1917. The 2/14th (County of London) Battalion (London Scottish) moved to France on 30 May 1918, which is after Crossland's death. He is buried in an individual grave in the Jerusalem War Cemetery, which, according to the CWGC, took in graves from battlefields and smaller cemeteries in the neighbourhood. The new documentation on the CWGC site confirms that he was in the 2/14th London Battalion and that his mother paid for the addtional text "Awaiting a Higher Command" to be added to his stone. 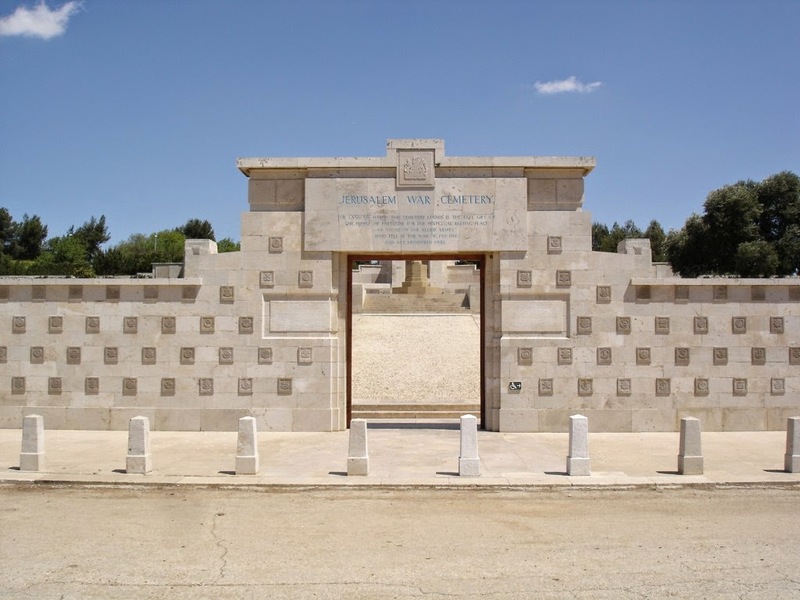 The record for the Cemetery notes that the advance to Jerusalem took place in autumn 1917 and that the Allied forces formally entered the city on 11 December 1917. It is hard to say for sure how or when Crossland was injured (he died of wounds according to his SDGW entry), however looking at the other men buried in the same cemetery there are quite a lot from the London Scottish, the London Civil Service Rifles and the London Irish Rifles who were killed at the end of April and the beginning of May 1918 suggesting a battle of some kind. A search of Wikipedia for the dates and area brought back a report on the attack on Shunet Nimrin and Es Salt in which the 60th London Division took part. This is a very detailed report and I will let you go and read it yourselves! It does seem likely that this was the action in which Crossland and his colleagues were killed and injured. There were 1,116 casualties suffered by the London Division from a total of 1,649 British Empire casualties, including Anzac and Australian soldiers too. The reason that this story caught my interest is the question why the family moved from Barnsley to Wallsend? Another Google search on Crossland's unusual name brought back a listing on a War Memorial at St Peter's Church in Wallsend. So he was also remembered in the area in which his mother was living in the 1920s. I have sent an email to the group researching this memorial asking if they know anything about the family. A general search on the Ancestry website gave me the information that Crossland Barraclough was baptised in Tankersley on 17 June 1894, his parents (as we know) being Oswald and Amelia Barraclough. As this combination of names is very unusual I have confidence that we have found the right family. Oswald Barraclough married Amelia Crossland in the September quarter of 1890 in the Barnsley Registration District, probably in St Edward's, Tankersley or St Peter's Church in Hoyland Nether as that is the area where the young couple are living in 1891, with her widowed mother. Eliz Crossland is 'Living on her own means' and her sons Walter and Joseph have good jobs, Walter as an Assistant Schoolteacher and Joseph as a Grocer's Assistant. Oswald, who gives his occupation as a Coal Mines Deputy was born in Silkstone around 1867. Amelia, who is a little older than Oswald, had been born in Tankersley in 1865. In 1901 Oswald and Amelia are living on Pinfold Hill in Ardsley. Oswald is still listed as a Colliery Deputy. They only have the one child, Crossland. However a search of the baptisms on Ancestry reveals that they had a child, Millicent Edna, who was baptised in 1900 in St Mary's Woodkirk which is on the far side of Wakefield from Barnsley. On the baptism Oswald's occupation is given as Under Manager Pit. Searching on the Old Maps website I can find Woodkirk and there are a lot of quarries and brick works nearby, but I can't pin point a likely coal mine that Oswald might be working at. Maybe it was very short lived and that's why he came back to Barnsley. Millicent Edna Barraclough dies in the Wakefield Registration District (the same one in which she was born) in the September quarter of 1900, and was buried in the same church at which she was baptised aged just five months. Interestingly Millicent is remembered on her father's gravestone in Barnsley Cemetery along with her brother even though she is not buried there either. By 1911 the family have moved into the central part of Barnsley, Lingard Street is just off Victoria Road, very near to the current Barnsley College. A further daughter, Constance Muriel, has been born to the family at Stairfoot and thanks to the additional information on the 1911 census we know that Oswald and Amelia had been married 20 years and only had three children, one of whom died young. This is a very small family for this era, did Amelia have difficulty getting pregnant or did they purposely limit their children? Oswald is now a Colliery Underviewer. Crossland is working, despite being aged only 16 years, he is a Bursar, a job suggesting the handling of money and which sounds responsible and which could lead to better things. Has he obtained a good post because of his father's position? Oswald Barraclough is listed on the Durham Mining Museum website as being the Under Manager of the Wallsend Colliery in 1914. From 1921 to 1927 my own great, great uncle Edward Nutley was the manager of one of the mines in this group. My own grandfather William Satchell Hutton worked at a pit in Wallsend until 1931, which was the year he married my grandmother at St Luke's Church there. We now know that the family were in Wallsend by 1914. We know that Crossland Barraclough enlisted in London (had he moved there to improve his job prospects?) and we know that when the CWGC approached Amelia for about his gravestone that she was living at 31 Beech Grove, Wallsend. This was probably in the early 1920s. Oswald Barraclough died in October 1920, so it was after that, and a search on FreeBMD shows that he dies in Barnsley! Odd. I had assumed he had died in the North East ... a search of the Barnsley Cemetery records show that he died at 54 Sackville Street and that he is the only burial in that grave plot. So Amelia was not buried with Oswald. I am happy to have found out why Amelia's address was in Wallsend after the war, but it would have been nice to have finished the story off properly. Maybe there will be a part 2! You never know. A fascinating story, Linda, thank you for all the hard work you must have put into it. I know where all the Barnsley addresses are, we lived at Ardsley for nearly 32 years.